June 12-14, 2019- Go here to register! Make the shift in your thinking to HorseWork! Explore the horse humans relationship through the horse’s point of view in the new workshop designed for those learning to facilitate therapy and learning sessions with horses. Learn how to recognize the questions that the horses are presenting to your clients and how to leverage the answers to support your sessions goals. This workshop is perfect for therapeutic riding instructors, equine specialists, mental health therapists and other professionals who want to learn how to leverage the very nature of the offerings from the horses that we partner with. This is your chance to deepen your knowledge of HorseWork and gain those skills that may not have been covered in other certifications and training. This workshop is all about the horse and focuses solely on working with horses in equine assisted learning and therapy. Refreshing your horse’s enthusiasm to partner with humans! This ground-based approach taps into the natural and playful attributes of horses to help clients learn essential life skills, problem-solving techniques, heightened awareness of their actions and the actions of others. This learning opportunity will guide you through the process of observing a horse-human relationship that stimulates new learning in humans. 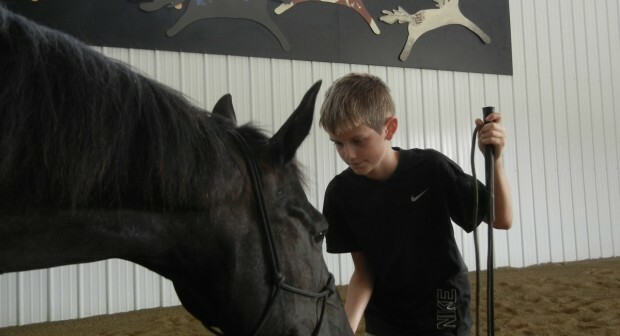 EAL (equine assisted learning) can open the door for a whole new approach to your program. Learning to play with horses, can offer a refreshing change for your herd while providing your business with the ability to serve a more diverse population. Learn how to facilitate ground activities that can empower clients to discover their own strengths and talents utilizing experiential education, coaching, and leadership development models. Participants will leave the workshop with a clear vision of how to work with horses in an EAL/T setting. Because you love what you do, HorseWork Education wants to expand your knowledge to help you make a living, doing what you love!